Ten year-old Livy and her mother visit Livy's grandmother in Australia. They haven't been there in five years and Livy doesn't recall much of the place -- just vague recollections and random images. But when they arrive, she starts to remember things -- not in the way one does when one has been away but as if she has always known certain things. The weirdness takes a step up when she finds a small creature in her closet named "Bob." Bob has been sitting in the closet for these past five years for Livy's return (because her last words to him were to stay there). He's passed the time dissembling and reassembling a Lego pirate ship and wondering where Livy went. Livy meanwhile had forgotten him altogether. Bob has a number of extraordinary powers. No one except Livy seems to be able to see Bob. The two of them can go outside with Bob wearing a ridiculous disguise which five year-old Livy made for him that makes Bob look like a chicken. And, after the five year interval, the two of them reestablish their connection. But while five year-old Livy accepted her friend as-is, ten year-old Livy wonders why Bob is here? And where did Bob come from? That search takes them on an adventure for ramifications much greater than childhood friendship. 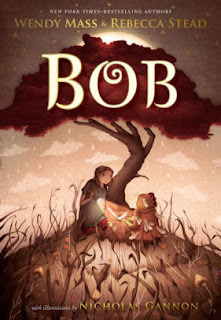 Told in alternating viewpoints between Livy and Bob, this is a sweet middle-grade adventure. Sort of an outback ET, there is a really big moral lodged at the end, but the story itself is a fun adventure that is a joyful read. Quirky illustrations liven the text throughout.